My friends, I am heartbroken. Our good friend Mike Leahy has passed away. Mike was one of the good guys. He had a heart as big as the sun. I will miss his friendship terribly. Ann and family are in my prayers. Mike Leahy: Retired USMCR helicopter crew chief, pilot and combat artist. Rest in Peace Marine. Hand Salute! It's hard to believe that it was just in July we were able to stop in N.C. and spend a couple of days with Mike and Ann. Please remember the family in your prayers. This is Vikki Leahy, Ann & Mike's daughter-in-law. I'm sad to be writing with some even sadder news. This past Friday morning at 3:30 Dad passed away peacefully in his sleep. He had taken a fall in early August and broken his hip and never really recovered from the injury and the surgery that followed. Ann wanted me to know that she tried to call you to let you know herself but couldn't get through. She will not be checking email, she doesn't have an address of her own, but if you'd like to call her I know she'd like to hear from you. 919-267-6331. Ann is doing as well as can be expected. We (all of her children and grandchildren) are rallying around her. We all have a new angel in Heaven watching over us now. Take care, dear man. I know Dad cherished your friendship. The location is Andrews Mortuary in Hampstead, N.C.
Burial mass and funeral will be Tuesday at the Montfort Point National Cemetery, near Camp Lejeune. Heavens gates will be well guarded! R.I. P. Mike, and may Ann and Vikki have peace. There will be some beautiful paintings of Heavens scenes . Will miss you Col.
A. Michael Leahy III of Cary, NC, died Friday, Oct. 15, 2010. A Mass of Christian Burial will be at 10:30 a.m. Tuesday at St Jude Catholic Church in Hampstead, NC. LtCol A. Micheal Leahy III, a Marine Corps Combat Artist, died peacefully, surrounded by his family on Oct. 15, 2010, in Cary, North Carolina. He was 77 years old. Born on January 19, 1933, in Cambridge, Massachusetts, Albert Michael Leahy III grew up in nearby Somerville, MA. He served two periods of active duty with the United States Marine Corps. In addition to being a combat artist, LtCol Leahy was a helicopter pilot, and had the honor of flying three presidents: Eisenhower, Kennedy and Nixon. He was a graduate of the Philadelphia University of Art and retired from the Marines in 1980 as LtCol USMCR. At the time of his death, he was painting commissions full-time at the Leahy Studio/Gallery in Cary, North Carolina. His many awards include the Presidential Service Commendation for Executive Flight Detachment HMX-1, and the Bronze Star with Combat "V". Throughout his career, his artwork has been featured on television, including documentary art for the Nataline Series during the 1973 Watergate deliberations. His artwork has appeared in many magazines, including US News&World report and All Hands Magazine. His paintings have been exhibited in the Marine Corps Museum in Quantico, VA and other venues. He was predeceased by his daughter, Kris in 2008. Surviving is his beloved wife of 56 years, Patricia, Cary, North Carolina, a son-in-law, Al, Virginia, a daughter and son-in-law, Erin and Randy, New Jersey, a son and daughter in law, James Edward Martin and Viki, Georgia; and NINE GRANDCHILDREN, Nate, Joseph, Libby, Albert, Sam, Madey, Marty, Gwendy, and Kevin, and one great-grandchild , Nerys. He is survived by five brothers and two sisters. 2010, at Andrews Mortuary Hampstead Chapel. A funeral Mass will be held at 10:30 am, Tuesday, October 19, 2010, at St. Jude the Apostle Catholic Church, Hampstead, NC. 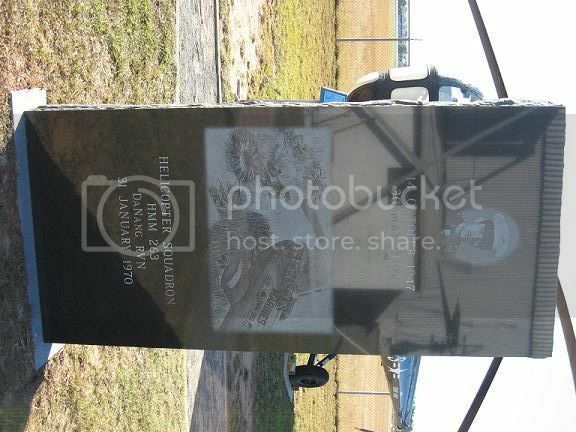 Burial WILL follow at COASTAL CAROLINA STATE VETERANS CEMETERY IN Jacksonville, NC. IN LIEU OF FLOWERS, THE FAMILY REQUESTS DONATIONS be made to: The Marine Corps Heritage Foundation, 3800 Fetter Park Drive #104, Dumphries, VA 22025. Condolences may be sent to the family at www.andrewsmortuary.com. I am saddened by Mikes Loss. Prayers are outbound for his Family. Another Marine reporting to Heaven, Sir. Hand Salute. Semper Fi, Ace. As Wally stated, Mike was truly one of the good guys. A true gentleman and one of the nicest people I've ever had the pleasure to meet. Mike was involved with the Association from the beginning and was one of the first Board members when Roger Herman incorporated Popasmoke. He generously donated his artwork on a number of occasions for our reunions. He was a soft spoken man who always had a smile on his face and a kind word for everyone. My heart goes out to his lovely wife Ann and his children. I feel blessed to be able to say that I knew Mike and could call him my friend. Godspeed Mike, I miss you already. This is truly sad as Mike was good people. I met him a few years ago and he had attended a number of our local Marine story telling nights. The last time I recall seeing him and his wife was at the last birthday gathering. I was looking forward to talking with him again this year. We will raise a toast to you next weekend buddy. That is for sure JJ. Mike will never be forgotten. He is there with the Best of them. Semper Fi, and READY-APP. 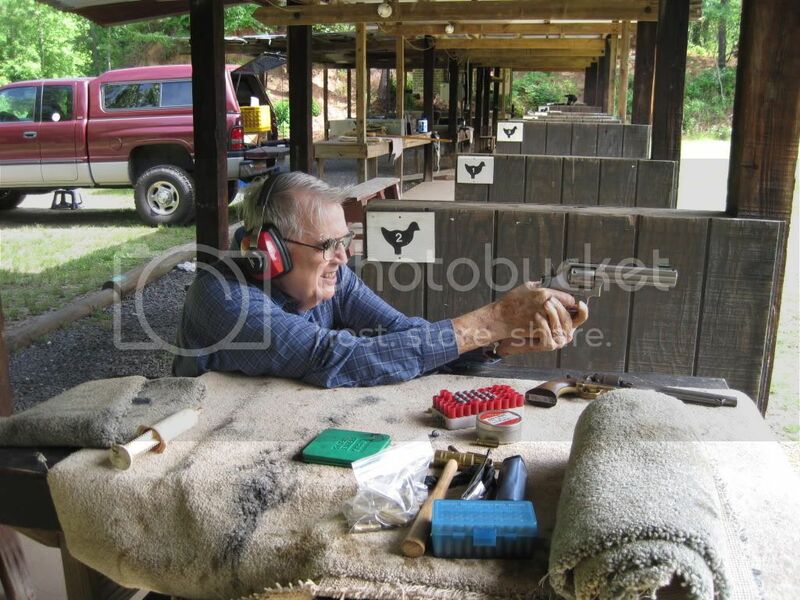 One of the local Marines took this pic of Mike at a range just north of Sanford, in Lee County NC, 26 May 10. Also for those who are interested to know the National Museum of the Marine Corps has over 200 works of Mike in their collection. Took this one at the Carolinas Aviation Museum in Charlotte NC a few years back when they unveiled Mike Clausen's CH-46D. Glad Mike loved taking pictures, and doing art. I know he loved firing those cannons in the 1st picture. Semper Fi, and READY-APP. I STILL HAVE A PRINT OF HIS BLACK & WHITE SKETCH OF MIKE CLAUSON'S SEA KNIGHT RESCUING THE MARINES UNDER FIRE; SIGNED BY MIKE CLAUSON (CMOH). I HAVE HAD IT FOR YEARS. I RECALL SOME YEARS AGO EMAILING COL. LEAHY ABOUT A PRINT (I THINK IT IS ONE OF TWO IN EXISTENCE) DONE BY ALEXANDER LEYDENFROST TITLED 'THE GIFT WRAPPED BATTLESHIP'. THE COL. DIDN'T SEEM TO THINK IT WAS REAL; I DID. I STILL HAVE IT; IT WAS NEVER COMMISSIONED BY ANY OF THE OTHERS WHO HIRED LEYDENDFROST TO DO SKETCHES; PAINTINGS, ETC. MINE IS NOT A LYCEE. NO ONE KNOWS WHO COMMISSIONED IT. PERSONALLY I THINK IT WAS THE BROOKLYN NAVY YARD'S BANK WHICH IS CLEARLY VISIBLE IN THE SKETCH WHO HANDLED PAYROLL FOR THE SHIP YARD WORKERS. I WISH I COULD HAVE SENT HIM THE THING TO EXAMINE. IT'S MOUNTED ON MARINE GRADE PLYWOOD LIKE THEY USED ON THE SUB-DECK OF THE IOWA CLASS BATTLE SHIPS. ONLY FOUR OF THE 16 SLATED TO BE BUILT WERE COMPLETED. THE HULL NUMBERS ON THE SHIPS HAD NOT EVEN BEEN ASSIGNED AT THE TIME THEY WERE UNDER CONSTRUCTION. I.E., THE BB-IOWA, MISSOURI, WISCONSIN AND NEW JERSEY. SURE MISS THAT GUY. WISH I COULD SENT HIM THE COPY I HAVE. THE BANK IS CLEARLY VISIBLE (THEN); NOW IT IS OCCUPIED BY THE LARGE INTERNATIONAL CORPORATE FUNDS TRANSFER ONLY DEUETCH (SP?) BANK. IF I CAN FIGURE OUT A WAY TO USE MY OLD DIGITAL CAMERA (C. 1997) I'LL TRY TO GET A JPG OF IT WITHOUT THE GLARE OFF THE LAMINATE OVER THE DRAWING. LEYDENFROST'S STANDARD SIGNATURE IS CLEARLY VISIBLE. COL. LEAHY WILL BE MISSED. Doc, lighting will help in getting the glare out of the picture. Just have to try dim light, or different types of light until the glare is out of the picture. Hope it works, and am glad you were able to get a print of nthe picture in question. Semper Fi, and READY-APP. 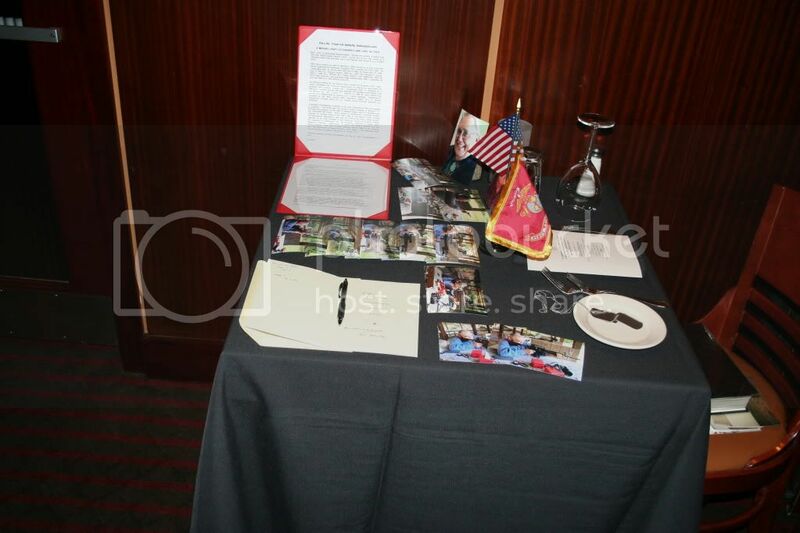 This past weekend we had our ball and had a spot for Mike at our POW/MIA table.